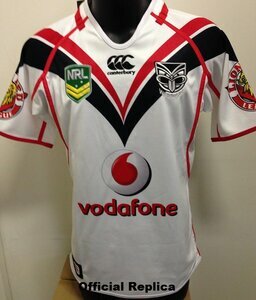 With the NRL badge having a face lift the Warriors didnt change anything from the previous years away jersey apart from putting on the new badge. OFFICIAL REPLICA - Plenty around if you are after one. 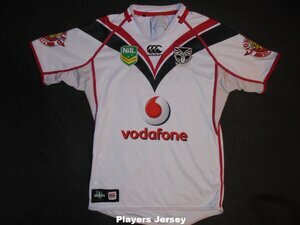 Pretty distinctive jersey with the new green NRL logo. Just watch for staining. Being a white jersey thats pretty common. 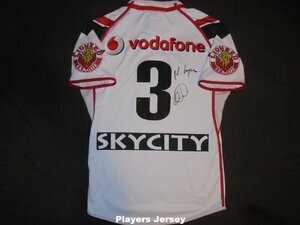 PLAYERS JERSEY - The players jerseys were the same as the replicas but with a taper and black number. They would also for the first time include a GPS pocket. The pocket was stitched on under the back neck hem and had a little sponge included for comfort.